I am stuck. After losing 20 pounds last year, I have not lost any additional weight. It is no mystery why; I eat and I cheat. My goal is lose 25 pounds total and I would like to do it before I head out for my long weekend en femme in Ohio next month. I have four weeks to do it and I know I can if I don't cheat. The trip to Ohio is for Hamvention, the big ham radio convention held annually in the Dayton area. If you are a ham (or not) and plan to attend, I hope we can make an "eyeball QSO." A lot closer to home, I will be attending and presenting at the Transgender Lives Conference on April 28 at the UConn Health Center in Farmington, Connecticut. Again, if you plan to attend, I hope we can meet in person. If you have been reading this blog for awhile, you know what I look like, but most likely, I don't know what you look like, so if you see me at Hamvention or Transgender Lives, or anywhere else, don't be shy — I'd love to meet you, so please introduce yourself and I'll talk your ear off! 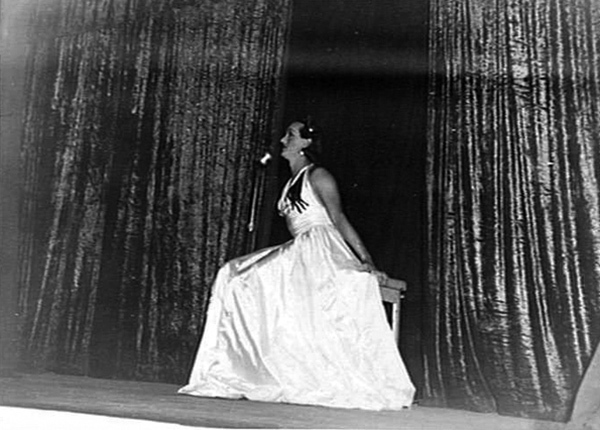 Femulating on stage for the Australian Army during World War II. If you are maintaining your weight then you are doing well most people gain it all back and then some. I think that most weight loss efforts hit a plateau. I was given strict doctors orders in October to lose weight since my A-1-C hit the diabetic range. I lost 25 lbs in 4 months and cut my number down to the pre-diabetic range. I still have a long way to go and would like to lose another 25 lbs but in the 2 months since I got my reading down I have only shed about 5 lbs. I think once the fear factor was cut down and the Sword of Damocles was not longer hovering over my head my license to eat and cheat was partially reinstated. You can do it, don't demotivate yourself, okay? 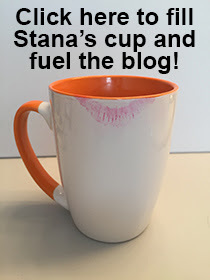 "A moment on the lips a month on the hips"
You can do it!!!! Just keep up the will power and the desired image in mind. You do present a beautiful woman. Love the current side picture. The flower dress and those heels and legs - Wow!! Have a fantastic day and thanks for keeping on with the blog. We need it daily. Or at least as often as you can and will. Cheers. Just another thought. I do love the pictures of the old army guys femulating while in the various prison camps. Wonder how many of them got their start there? And how many still do? I was fascinated by POWs doing drag. Was the enemy required to provide the makings for their prisoner's femulations? Or did the Red Cross packages include wigs and frocks? Have you tried a liquid fast for a day or so? I've seen it really work wonders to jump start weight loss. I have in the past with limited success.